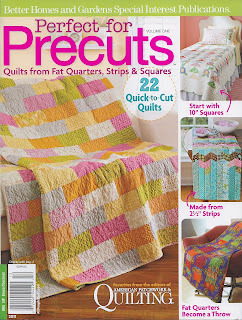 Have you seen this new American Patchwork & Quilting special edition magazine just for Precuts?? It's on the newsstand right now and is filled with loads of great projects. Some of my favorite designers have quilt projects in there....maybe they're some of your favorites, too! Not surprising.....this is my favorite quilt!! 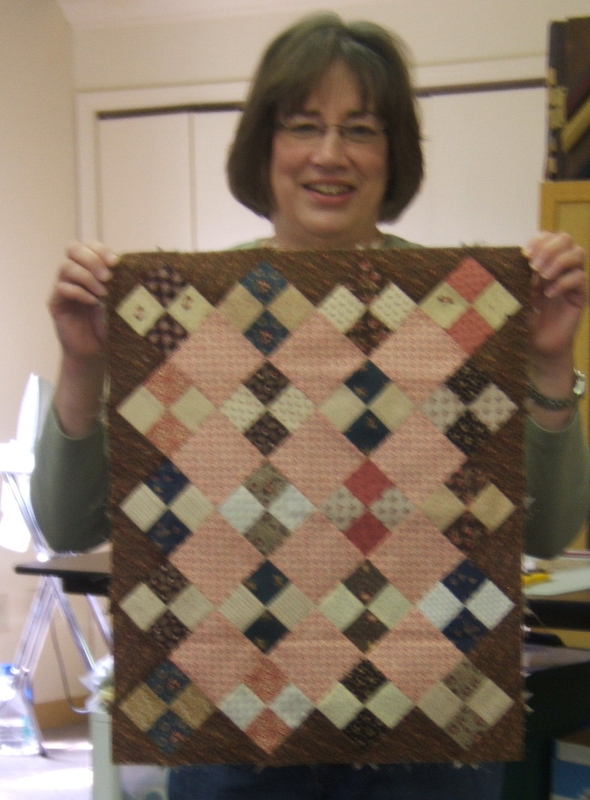 I've always, always loved Kansas Troubles fabrics and Lynne put her signature twist on making this classic quilt block. Treat yourself to a copy of this magazine. You won't be sorry!! Time to share more Prairie Women's Sewing Circle club Show 'N Tell photos! They are busy making Yo-yos and showing their Leap of Faith quilts. Love it with the dark background fabric, don't you? I'm also loving how the Heartland Crossing quilt turned out! While we're in Indiana....let's mosey over to The Back Door Quilt Shop in Greenwood, IN. 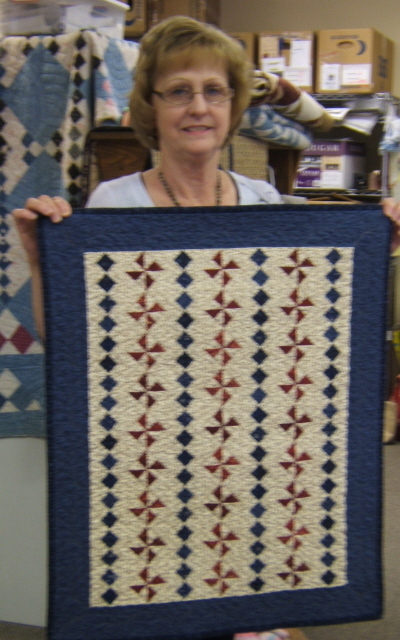 This quilt is called Seneca Falls.....very nicely done!! These Prairie Women are all showing off their Mrs. Olson's Hatbox tablerunners! And this cutie quilt is a wonderful version of At Mama's Knee. Love the colors and fabrics, don't you? I am so proud and touched by the work everyone has done. Thank you for sharing your Show 'N Tells with all of us. 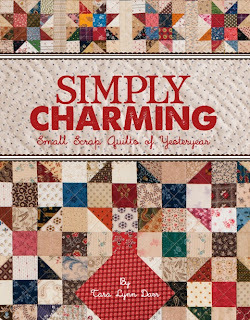 Remember a few months ago when I told you all about my ﻿friend Tara's new book Simply Charming? I said every quilt in the book was awesome and you'd love it! Well, it seems that I wasn't the only quilter who thought that....because......Tara's book is among the Top 20 books with a major distributor!!! Congratulations Tara!!! I'm not surprised at all and am so happy for her! If you haven't picked up a copy yet, you're missing something very good!!! Quilter's Rest Stop ~ Really? A year ago as I was traveling home from Iowa along I-80, I happened to stop at one of the hundreds of highway rest stops and was quite surprised to find all kinds of quilt blocks all over the facility. I knew I had to stop there again and - yes - show you photos of a highway rest stop. I can hardly believe I'm writing about this either....but take a look! This rest stop is located along a portion of the infamous Underground Railroad. This plaque tells the Underground Railroad story to travelers. The building is loaded with quilt blocks and other symbols of the Underground Railroad and its quilted path. Kinda neat, huh? All of the Underground Railroad blocks are inlaid in the floor. Inside, the route for safe passage is depicted on the floor, too. A colorful tile quilt brightens the room. Well, I don't know about you, but I thought it a very nice surprise, and a wonderful tribute to a piece of American history and the part quilting played in it. You can find it at mile marker 270 as you travel eastbound along I-80 in Iowa. I guess I'm a teacher at heart 'cause I love to teach. 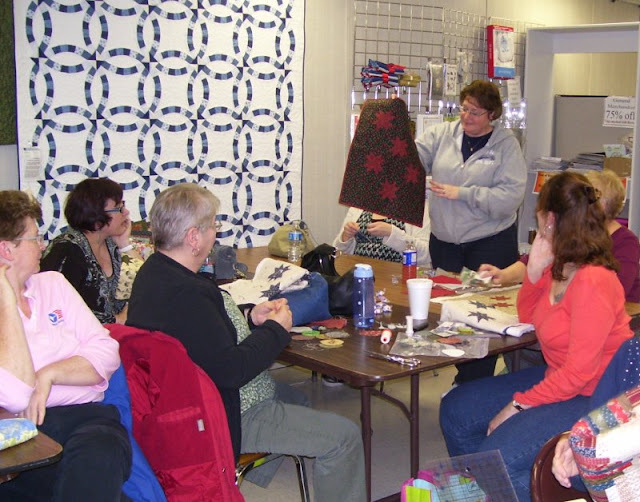 Put me in a room with some fabric lovin' quilters and it's a banner day....and that's just what I had on Sunday! Eighteen of the most delightful ladies from the Eastern Polk Quilter's Guild and I spent the day talking shop. 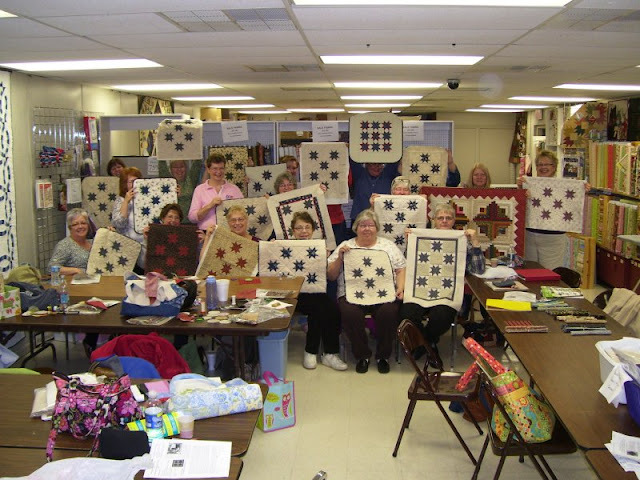 We worked on skill building and honing quilting techniques. At the end our time together, I had fun doing what I love and they learned some new tricks of the trade. I filled their heads with a whole lotta quilting hints, tips and secrets! They taught me a few things, too, and I love that! 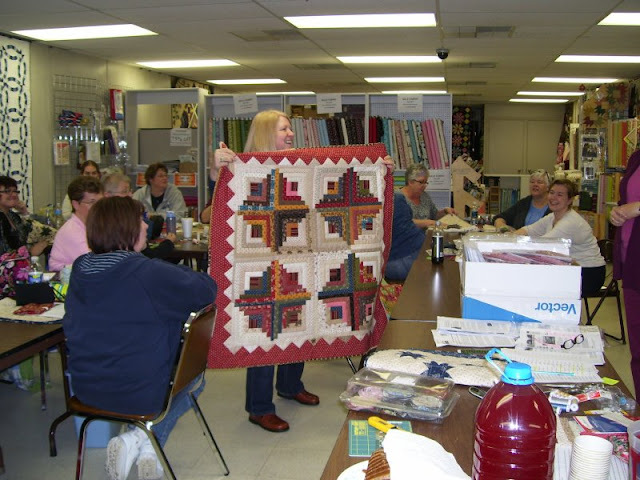 On Monday evening I was given a warm Iowa welcome from all the members of the Eastern Polk Quilter's Guild! They listened to my program about, among other things, the most useful quilting secrets, hints and tips I know (and wrestled from other quilting professionals! ), as well as my (now almost famous) starch recipe for how I prepare my fabrics for piecing. 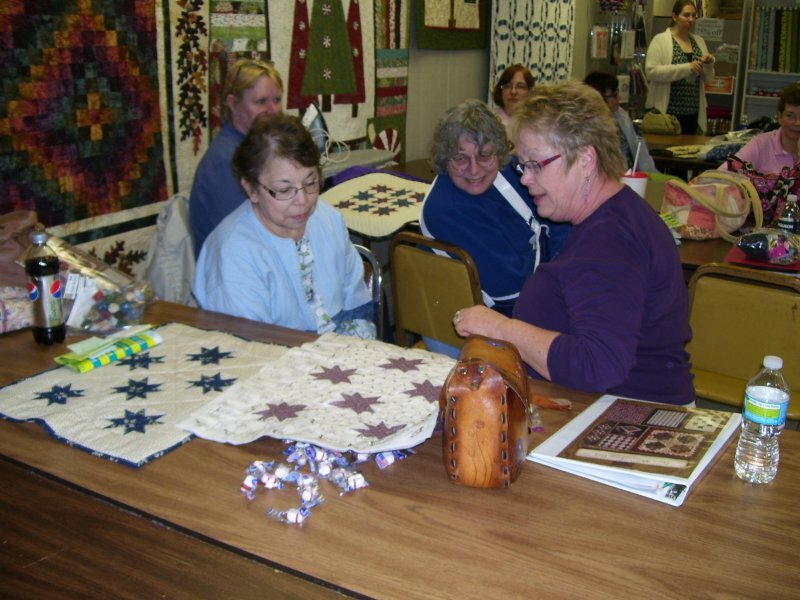 And took a look at a few quilts I brought for show-n-tell. We had a lot of fun during our time together and I sure hope I get to come back to Iowa some day. If you find yourself in the Des Moines, IA area, take the time to visit the quilt shops, go antiquing, and eat at a terrific array of wonderful restaurants because you'll be treated to some fine Iowa hospitality!! My heartfelt thanks to everyone!! Nicki and I had a wonderful time. Yesterday, I began my shop hop at the Quilting Connection in Ames. When I walked in, the shop was buzzing with activity. 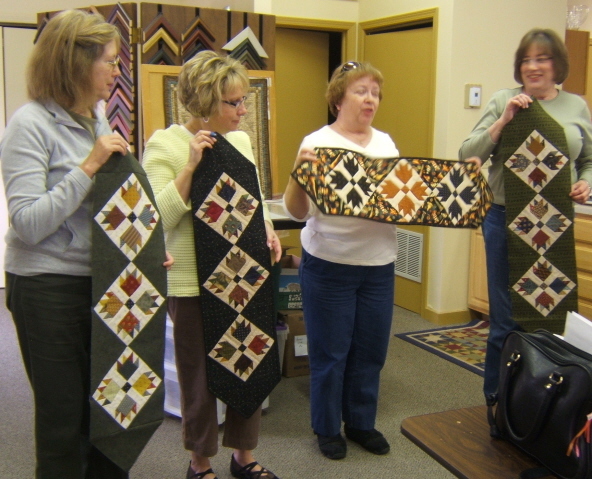 There was a weekend quilting retreat in progress, another group taking a handbag class, shoppers looking for fabrics and planning their next quilt, and others showing off their gorgeous work. Saying The Quilting Connection is a full service shop is an understatement. They have everything! Every kind of fabric you would ever want. Books, notions, and sewing machines are﻿ supported by the shop's friendly staff. I enjoyed my time there, and best of all, had a chance to chat with Cathy who runs the Prairie Women's Sewing Circle club that boasts 50 plus members! My second stop was in Adel. What would you do if you saw this? Park and check it out, of course! This cute barn is your first welcome to Adel Quilting & Dry Goods. ﻿﻿As soon as you walk in the door, you're awash with warmth and inspiration. They have a very nice selection of fabrics with something for everyone. Lots of Moda Bake Shop items and great kits, too. Need to take a class? No problem..they offer classes as well. Goodies all over the place! I just stood there and looked around trying to take it all in. You know how that is when there is so much good stuff to look at and you don't want to miss anything? Naturally, I found a few things I couldn't live without. I had the most delightful surprise when I walked in the door.....a group of the Adel Prairie Women had arrived to meet me. We had a very nice time talking about the club. Their club of 35 members just finished Journey One and are looking forward to beginning Journey Two shortly. Time got away from me gabbing with the ladies and before we even gave a thought to taking pictures, most had left the shop, but here I am with two lovely Adel Prairie Women. We hit it off so well, we could have easily just kept on going! Everywhere you look it's glorious eye candy. The store is smaller than I thought it would be, but it's packed with wonderful goodies in every nook and cranny. The Valdani display is a feast for the eyes, too! Beautiful cotton fabrics are one feature of the shop. You can find a large selection of Andover - Jo Morton, Judie R and others from Marcus Bros, Julie Hendricksen and Windham, Kansas Troubles, and a very large selection of hard to find Daiwabos. Then....for all you wool lovers (me included), it's knock your socks off wool yardage for applique, and several width cuts for rug hooking. ﻿Look at the cute displays! 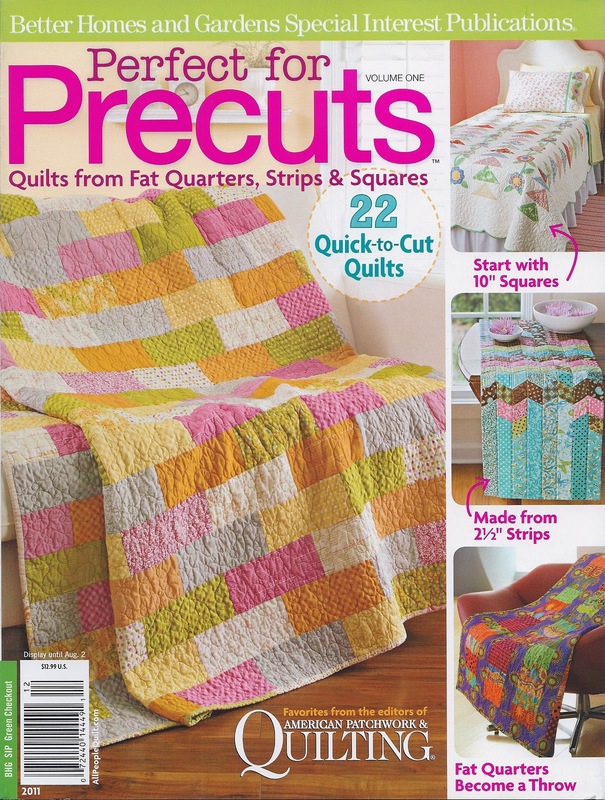 There are kits for cotton quilts, wool projects of all kinds and combos of both cotton and wool. Fabrics are mixed in with antiques and vintage goodies everywhere. Look how cute the kitchen is! I want to move in. Even the screen door to the shop office is adorable! End of Winter Road Trip!! The touch of spring we are enjoying makes me want to be out of the house, and luckily for me, I have a trip planned. Tomorrow morning, my daughter Nicki and I will be headed to the Des Moines, Iowa area to give a lecture and workshop, do some shop hopping, meet with Prairie Women, and have some fun! While Friday will be a travel day, I do plan on stopping at The Woolen Needle in Williamsburg, IA....a shop that was featured in the last Quilt Sampler issue and one I really want to see. It's my kind of shop and has not only lovely cottons but wool, too! Saturday will bring me to two special quilt shops where I will not only get to shop, but also get to spend time with the ladies who belong to the Prairie Women's Sewing Circle clubs. In the morning, I will visit The Quilting Connection in Ames, IA, and in the afternoon, I'll be at Adel Quilting & Dry Goods shop in Adel. I am soooo looking forward to meeting everyone! I had one of those ~ Oh, NO!!!! ~ moments when out of the blue, it dawned on me that perhaps I left out some very important information from the Sugar Mountain pattern. Information you'd really need - kinda like to have - if making the quilt. Horrified...I rushed to my computer, powered up Word, and scanned the pattern. UGH! DRATS! CURSES! I did forget!!! I forgot to include the cutting instructions for the side, setting and corner triangles as well as the borders. Geez, Pam.....(I said pretty words in my head I won't repeat here). Today I feel like Rocky when he reached the top of the stairs in Philly, pumping his arms in the air! Why? Because I'm not a computer whiz by any stretch of the imagination and usually have to fumble thru new tasks. Today, after several hours of trial and error, I conquered my task....to make my freebie pattern Sugar Mountain available to you all just by saying.... Click Here !! Actually, you'll be able to get the pattern from the next posting above. Sugar Mountain was a lot of fun to make. The simple Friendship Star block is jazzed up a bit with the addition of pink squares showing the block on point. Naturally, I added a few Make-Do blocks in there. Not surprised, are you? While the color theme of the quilt are pinks and blues, I added one cute black print Friendship Star block because black prints are common Make-Do substitutions for blue prints and vice versa. I love the way it looks! Can you spot more Make-Do blocks? I chose a simple blue border to frame the quilt. Sometimes.....simple is the best. The Farmer's Daughter version does have a pieced border...but for now...that's all I can say! I have a collection of antique pink and blue quilts and will welcome this little quilt into the mix. Once it's quilted and bound, I'll be sure to post a photo. Speaking of photos.....if you make Sugar Mountain...please email me a photo. I'd like to do a show-n-tell post one day. P.S. I've received several comments and dozens of emails requesting more information about how I make my labels. I will post more about this in the near future. I finally finished the pink and blue quilt I was working on. Don't you love that feeling of accomplishment when you've finished a quilt top? Even more so when you're satisfied with the result! I've made more than a few quilts where I haven't loved it at the end, not because it didn't look great, but somehow....we spent too much time together. I was never so happy when it was finally finished....funny 'cause I was so excited when I began! Then...you have a break from it while it's gone to the quilter. You begin working on something else - different fabrics - different palette - different blocks....you forget about how you felt. When the quilt comes back from the quilter, you're loving it all over again! What comes right after completing the quilt top? Yup...making the backing, binding, and the label. Most of the time, I make the binding right away.....that is if I know what fabric I want to use for the binding. In this case, I want to wait to see how the quilt looks after it's quilted, so no binding for now, but I did make a couple of labels. The large quilt I just finished is called The Farmer's Daughter. It will be unveiled in a few weeks....I promise! I print my labels on my computer using background fabrics from my stash that will match the others in the quilt. I then add borders to the label from the leftover scraps, and turn the borders under creating a frame. Then, the framed label is sewn onto the backing fabric. That way, it will be quilted right into the quilt. I really like doing it this way because I don't have to piece it into the backing. I love how labels look when they're pieced in, but I just won't take the time to do it, so this is a good option for me. Another nice thing is that by creating labels like this, I can add them to a quilt at any point.....later after they've been quilted, or to an older project, or an antique I purchased. Nice to have options! The small version of The Farmer's Daugher ~ the quilt I will be giving you the freebie directions for ~ is called Sugar Mountain. When I print labels on my computer, I do two at a time.....so while I was in "label mode" I made this one too. Don't you love the backing fabric?! It's from the Little Pink Stars line by Margo Krager for Blue Hill. It was the perfect fabric for both of my quilts....especially since it's the same color palette. The blocks are done, and I will be sewing the top together today. If all goes well, I hope to have the photo and pattern for you by the end of the week.